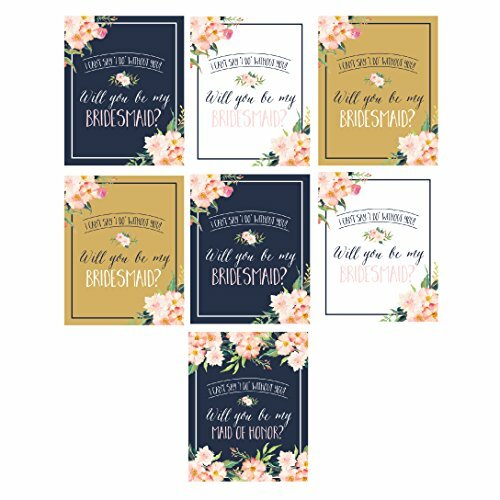 BONUS - 2 x's White Bridesmaid Labels + 2 x's Gold Bridesmaid Labels + 2 x's Navy Bridesmaid Labels + 1 x Maid of Honor Navy Label are included with each order. · 2 x's White Label "I can't say I do without you! Will you be my bridesmaid?" · 2 x's Gold Label "I can't say I do without you! Will you be my bridesmaid?" · 2 x's Navy Label "I can't say I do without you! Will you be my bridesmaid?" · 1 x Navy Label "I can't say I do without you! Will you be my maid of honor?"